A Small Boy Smiling by Matt Carey is a story of childhood sexual abuse and its aftermath as well as the eventual spiritual awakening resulting from these early experiences. 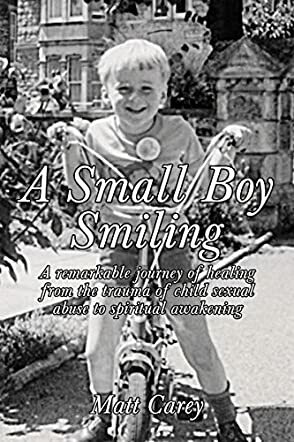 A Small Boy Smiling is the story of Matt’s life which he has written focusing on the perspective of the sexual abuse and how it affected his life, for better or worse. Matt was caught in a ring of pedophiles at a young age and the abuse continued for over a year with multiple men. He told no one and battled with severe alcoholism throughout his teenage years and early adulthood. Then change initially happened in the form of Alcoholics Anonymous and their meetings, which enabled him to kick the hold alcohol had over him. In this book, he talks candidly about the details of the abuse, his diagnosis of complex-PTSD arising from it, his problems with women and sexuality as a result of the abuse, his recovery from alcohol addiction, and his turn towards a more spiritual path in life where he explored the Eastern traditions, meditation, Hinduism, Sufism, Buddhism, and his lifelong quest for spiritual wisdom and understanding through his frequent travels to India and the East. There is also a chapter written by Matt’s therapist on what she does, and her own experience of working with Matt. I really liked how Matt has told his story. His sincerity and genuine attempts to analyze and convey his life experiences, even the most difficult ones, come through and I appreciated his willingness to share so much detail. The book also shines a light on complex post-traumatic stress disorder which is distinct from PTSD in the sense that complex-PTSD results from a prolonged, extended period of trauma, unlike PTSD which pertains to short, specific incidences. I hope a book like this spreads awareness of complex-PTSD and the effects of trauma in general and gets it recognized as a valid mental illness or disorder. It is also important for people to recognize signs of sexual abuse in children and this book may help with that as well. Overall, I was glad to find Matt seems to have found some peace in his life and I would certainly recommend reading this book.